Allen Iverson Highlight DVD 8 hours of Iverson highlights from ebay user C quality. Atlanta Hawks Highlight DVD 1 hr 30 mins of Hawks highlights from 91 to 95. Features a lot of Dominique Wilkins highlights. Features 1990 Dunk Comp. 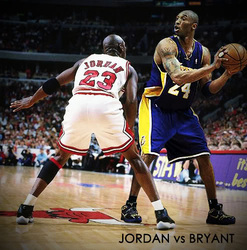 Kobe Bryant Highlights DVD C quality, approx 1 hr 30 mins in length, Feature highlights from 90’s. Highlights come from NBA action, inside stuff, rare interviews and TV stories on each. Magic Johnson highlights DVD 2 hrs Includes interviews on Letterman and Oprah, a bunch of highlights from his 96 comeback, old NBA action stories, rare interviews ect. Magic Johnson Highlights 94-96 2 hour DVD featuring highlights from Magics time as coach to 96 comeback. Michael Jordan Bulls Highlights (Recently Re-done with 1 hour of extra footage) 2hr dvd featuring clips of his years as a Bull. 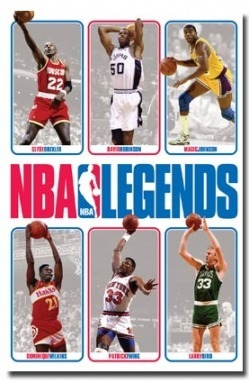 Features plenty of NBA action highlights, interviews and a few rarely seen highlights C quality. Michael Jordan Wizards Highlights 2 hr DVD of highlights from MJ’s 2 years in Washington. Most highlights come from Sports centre, NBA action. C quality. Shaquille O’Neal Highlights DVD C quality, approx 1 hr 30 mins in length. Feature highlights from 90’s. Highlights come from NBA action, inside stuff, rare interviews and TV stories on each. College Highlights DVD B quality, 50 minutes. Features college highlights from Shaq, Mourning, Penny, Mashburn, Webber, Jim Jackson, Miner, Larry Johnson, Isiaah Rider, Coleman, Abdul Rauf, Augmon and other lesser names. 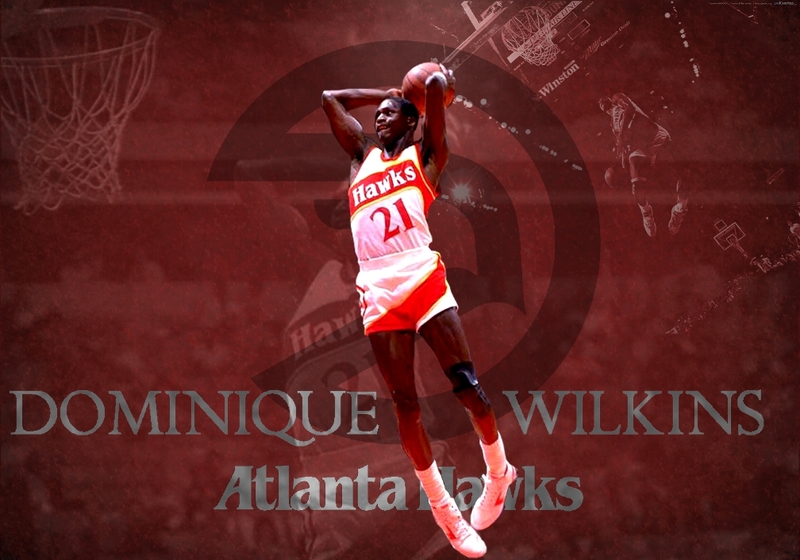 Beyond the Glory Dominique Wilkins Fox Sports Net documentary C quality. Beyond the Glory Dennis Rodman Fox Sports Net documentary C quality. Beyond the Glory Kobe Bryant Fox Sports Net documentary C quality. Beyond the Glory Mark Cuban Fox Sports Net documentary C quality. Beyond the Glory Paul Pierce Fox Sports Net documentary C quality. Beyond the Glory Reggie Miller Fox Sports Net documentray C quality. Beyond the Glory Steve Francis Fox Sports Net documentary C quality. Beyond the Glory Vince Carter Fox Sports Net documentary C quality. Beyond the Glory Kevin Garnett Fox Sports Net documentary C quality. Beyond the Glory Manute Bol Fox Sports Net documentary C quality. Beyond the Glory Michigan Fab 5 Fox Sports Net documentary C quality. Beyond The Glory Grant Hill Fox Sports Net documentary C quality. Beyond The Glory Karl Malone Fox Sports Net documentary C quality. 1988 Chicago Bulls - Higher Ground highlights DVD. Features highlights and season review of Chicago Bulls 1987-88 season B quality. 1994 NBA Draft features the drafting of Glenn Robinson, Jason Kidd, Grant Hill and others. Heaps of NBA clips from 93 to 95. Profiles on Van Exel, Divac. 1 hour 30 mins total, quality varies. Profiles on Eddie Jones, Van Exel, Ceballos. 1 hour 10 mins total, quality varies. 1 hour 25 minutes total, quality varies. 3 hours total (2 Discs), quality varies. Coverage on Rice - Jones trade. 3 hours (2 Discs), quality varies. NBA Action full series 1999 all Reg. 1st & 2nd rds of playofs season episodes on 2 discs. Features a lot of Inside Stuff highlights from 1999 also. Top 10 Plays 1998-2002 all the top 10 plays from NBA Action each week over a 5 season span. B quality. NBA Action full series 1999-2000 all Reg season episodes on 2 discs. NBA Action 2000-2001 Reg. season episodes on 1 discs. Larry Bird A Basketball Legend 1 hour documentary on Larry Bird A quality. Jordan to The Max A quality in full. Charles Barkley - Sports Century presented by ESPN, 45 min documentary on career of Barkley C quality. Ultimate Jordan features all Michael Jordan official release videos. A quality. 2000 NBA Now Showmen of NBA today, A quality. 2001 NBA Live Now The music videos, A quality. 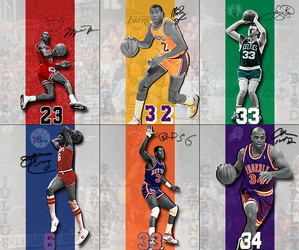 Put Magic In Your Game instructional release featuring Magic Johnson, features Magic Highlights and tips to improve your game. NBA Superstars 2 and 3 features highlights of NBA stars to music videos B quality. 1993 NBA Draft NBA TV re broadcast, complete 1st rd and some 2nd round, features drafting of Chris Webber, A. Hardaway, J. Mashburn, S. Cassell and others. Inside Stuff 2 episodes from 1999 pre-season, Jan 28 99 and Feb 6 1999, C quality. features pre-season highlights, interviews and features on Olajowon, Mark Jackson, McDyess and Utah Jazz. 2002 DVD Born 2 Ball hosted by Paul Pierce features high school footage of Pierce, KG, Kobe, TMac, Iverson, Rip Hamilton, Rashard Lewis, J Rich, Jefferson, Stoudemire, and many others. 2005 DVD Furious FinishesA quality, features stories on some of NBA's greatest finishes. 2005 Sebastian Telfair Through the fire documentary B quality. Miami Heat 05-06 Championship DVD A quality documentary on Miami's championship season. Dennis Rodman 'On the Rebound' full series of documentary on Dennis' attempt to get back into the NBA. The Lost Dunks - 1 hour TNT Special on great dunks over the years from the dunk contest that have seemed to been forgotten. MTV Cribs features NBA players giving you tours through there homes in this MTV show. features players Nick Van Exel, Baron Davis, Carmelo Anthony, Jayson Williams, Jason Kidd, Jerry Stackhouse, Damon Stoudamire, Penny Hardaway, Rasheed Wallace, Shaq, Steve Francis, Zach Randolph. Boston Celtics Championship DVD 2008 documentary on Celtics championship season of 2008. Real NBA: Lakers 2009 Champions 1 hr A quality, documentary about Lakers playoff run to winning the championship. NBA Action 1997 2 episodes. NBA Action 2003-2004 5 episodes C quality. NBA Action 2004-2005 7 episodes, C quality. Pro's vs Joe's Season 3 2007 complete season B quality, this show puts regular people against retired star athletes in order to win prize money. This series features retired athletes Warren Moon, Al Leiter, Nick Van Exel, Jimmy Smith, Ricky Williams, Charles Oakley, Kenny Anderson, Ricky Williams, Derrick Coleman, Dan Majerle, John Randle, Mitch Richmond, Sean Elliott, Rod Woodson, Alan Houston, Jamal Anderson and others. 2009 More than a game - five talented young basketball players from Akron ohio star in this remarkable real life coming of age story about friendship and loyalty in the face of adversity. Stars LeBron James C quality. Kobe Doin' Work is a 2009 documentary film directed by Spike Lee It focuses on Kobe Bryant during one day of the 2007–08 Los Angeles Lakers season. HD 544p. 2010 Winning Time: Reggie Miller vs. the New York Knicks Peabody award winning director Dan Klores explores how Miller proudly built his legend as "The Gardens Greatest Villian". A quality, 1 hr 30 mins. 2010 Without Bias: Len Bias Documentary A quality 1 hour in lenght. Documentary about Celtics 1986 draft pick who tragically overdosed on drugs and dies the day after being drafted. No Crossover: The Trial of Allen Iverson A quality 1 hour 30 minutes. Features the story of an Bowling Allen brawl involving Iverson and some fellow members from his community. 2010 The Guru of Go: The Hank Gathers Story A quality 1 hour in lenght. This documentary features the sotry of Paul Westhead and his fast breaking 'system offence'. This Documentary goes into detail the story and tragic death of Hank Gathers while being coached by Westhead at LMU. Jordan Rides the Bus ESPN 30 for 30 documentary on Jordan's stint as a minor league Baseball player A quality. Once Brothers: Documentary on friendship between Vlade Divac and Drazen Petrovic 1 hr 30 mins A quality. 1978 NCAA Final Four review 30 minute ESPN special featuring highlights from 1978 NCAA tournament. A quality. Patrick Mills Aussies Abroad 30 minute documnetary on Aussie PG and Portland Trailblazer Patty Mills. A quality. 2010 ESPN 30 for 30 'Fab Five' documentary There is little debate in the college basketball world that those five players, who joined the Michigan Wolverines as freshmen in the fall of 1991, represent the greatest class ever recruited. full doco B quality. Feb 7 1995 ESPN Up Close - Nick Van Exel 15 total running time A quality, missing last segment of show. features one on one interview with Nick. ESPN Dream Season 2008-2009 full copy B quality, 50 minute documentary on LeBron James and Kobe Bryant. Magic Johnson & Larry Bird: A Courtship of Rivals A HBO Special on Basketball legends Larry Bird and Earvin "Magic" Johnson as they discuss their unmatched rivalry and unlikely friendship. HD 544 p.
ESPN Unguarded: The Chris Herren story 2 hrs B quality, This documentary follows former Celtics and Nuggets PG Chris Herren and looks into his trouble with alcohol and drug addiction. The Announcement - ESPN Films Documentary on Magic Johnson's HIV announcement in 1991. Full documentary A quality. ESPN Broke - ESPN documentary on professional athletes who have gone broke after earning millions through sports. HD 720p. ESPN Benji - ESPN documentary on Chigaco High School star Benjamin Wilson and his tragic murder in 1984. HD 720p. Sam Bowie - Going Big Great documentary on Same Bowie’s ride from 2nd pick of the 1984 draft, picked over Michael Jordan, Charles Barkley, John Stockton etc. Great watch, goes for an hour, HD 720p. Big Game James - James Worthy 23 minute NBA TV documentary on James Worthy A quality. ESPN 30 for 30 Bad Boys 720p, full doco on the 1980's Detroit Pistons. ESPN 30 for 30 Requiem for the Big East 720p, full doco on the Big East and Georgetown Syracause rivalry in the 80's. NBA TV's - 1984 NBA Draft HD 720p, documentary on the greatest draft ever featuring Olajuwon, Jordan, Barkley and Stockton.